Also referred to as electromagnetic cranes, these cranes are used to handle and move metals like steel and iron. Magnet cranes can be found mostly in recycling plants and scrap yards. They operate using a magnetic field that is formed by an electric current passing through windings around the magnet. The magnet is turned on and off when needed by the electric current.The electrical current travels through an electromagnet that consists of an iron middle with a wire enclosed. These cranes have a simple job; moving metals from one area to another. The magnet picks up metals, moves them to where they are supposed to go, and the magnet is cut off, releasing the metals. A reliable power and automation cable is a necessity for these cranes because of the constant current that is running through, plus it’s frequently turned on and off and subjected to hard usage. Charge cranes are found in steel-smelting furnace units to load scrap or ore into the furnace. Charge cranes can be floor-mounted (underslung) or raised overhead.Floor-mounted charging cranes are installed in shops with large furnaces that have a capacity of 150 tons or more. Machine assemblies are installed on a bridge and they move along rails arranged on the platform of the furnace bay. The load volume for these cranes can reach 15 tons. With a simple design, they are reliable in output with high production. One machine can handle four furnaces.Floor-mounted cranes without rails can move multi-directionally and are designed to service lower capacitance furnaces. They can move easily, even on small platforms.Overhead charging cranes are designed for medium capacity furnaces (20-150 tons). The overhead crane consists of a bridge crane with a central carriage and secondary carriage. Its role is repair work and slag removal. One of the advantages of the overhead crane is absence of rails which allows for easier servicing of furnaces.The power cables used in this application undergo rigorous flexing, so it’s imperative to use a flex cable that can survive the constant flexing and tension. The first two are designed for medium tonnage ladle cranes while the four-girder/six-rail are designed to handle heavy-tonnage. Though the cranes themselves are easy to maintain, the cables are subject to extreme temperature, so it’s essential that a high temperature power cable is used to withstand the high heat. 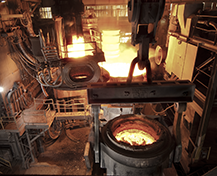 Crane applications play in integral role in the steelmaking process. Any disruption will cost your plant money in unplanned downtime and replacement power cable. If you’re experiencing routine cable failure, there’s a better way. Contact us today and let’s see how we can solve your cable issues!